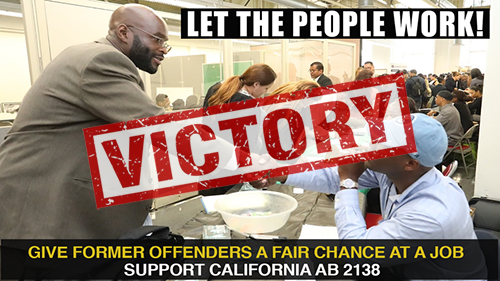 We are currently advancing our landmark criminal justice reform bill, The People’s Fair Sentencing & Public Safety Act, to the 2020 ballot in California. We are currently fundraising and signing up volunteers to collect more than 623,000 signatures from registered California voters. Once passed, our new law will allow for fair resentencing of nonviolent “three strikers” and release thousands of nonviolent Californians back to their families and homes. It will also save the state more than $100 million annually which will be invested in youth programs, education, and rehabilitation. Senate Bill 136 repeals a mandatory one-year sentence enhancement that is added to an individual’s base sentence for each prior prison or felony jail term served. This enhancement impacts about one-third of people serving time in California prisons. Learn More. Currently, if an individual is convicted of a felony and has served time in jail or prison for a prior felony, a one-year enhancement must be added to their sentence even if neither their current nor prior felony is serious or violent. SB 136 is co-sponsored by the ACLU of California, California Coalition for Women Prisoners, Californians United for a Responsible Budget, the Coalition for Humane Immigrant Rights, the Drug Policy Alliance, the Ella Baker Center for Human Rights, the Friends Committee on Legislation of California, Legal Services for Prisoners with Children, Pillars of the Community, Tides Advocacy, and supported by Unite the People and our thousands of statewide volunteers. 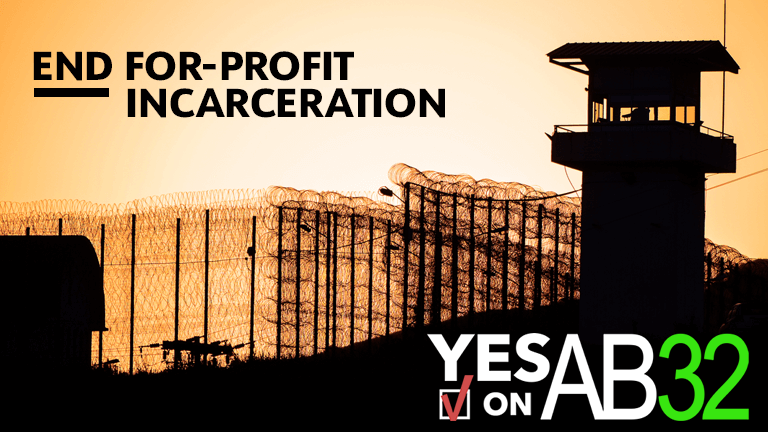 Assembly Bill 32 will prohibit the California Department of Corrections and Rehabilitation (CDCR) from entering into or renewing contracts with private, for-profit prisons beginning January 1, 2020. Additionally, all state prison inmates would need to be moved out of existing private, for-profit prison facilities no later than January 1, 2028. Unite the People is currently gathering signatures, phone banking, and pushing statewide legislative committees to advance the bill. Sign up to volunteer today. Assembly Bill 45 would eliminate medical and dental co-payments for people inside of California prisons and jails. Currently, people in California prisons are charged a $5 co-payment when they initiate medical or dental services. The average wage for people in prisons is just $0.08 an hour—meaning medical and dental visits can cost more than an entire week’s pay. Learn more. The high cost of healthcare in prisons discourages many people from seeking care until it is an emergency. This barrier to healthcare jeopardizes not just the health of the imprisoned, but also the health of prison staff and the public, as sick people who avoid doctors are more likely to suffer from more severe illness and increased infection rates. Sign up to volunteer. AB 45 was introduced by Assemblymember Mark Stone (D-Monterey Bay), is co-sponsored by Initiate Justice, ACLU of California, California Coalition for Women Prisoners, and the Ella Baker Center for Human Rights, and endorsed by Unite the People and our thousands of statewide volunteers, who made phone calls and sent emails to the Public Safety Committee in support of this campaign. Status: CDCR agreed to implement the rule 3/1/2019. Thank you to all of our volunteers who made phone calls to the Safety Committee, CDCR, and sent in emails to support this campaign! UTP will continue to support the legislation and its co-sponsors with volunteer time and resources as needed. 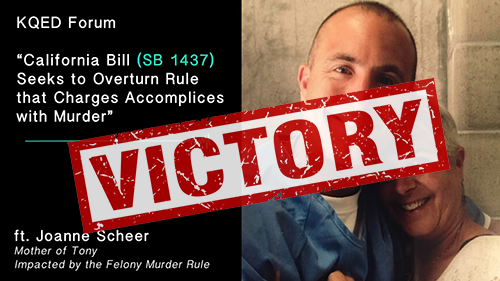 Senate Bill 1437 amends California’s felony murder rule, a centuries-old legal doctrine that has held people automatically liable for first-degree murder if a death occurs during the commission of a crime, even if an individual did not intend for a killing to occur or aid the killing in any way. 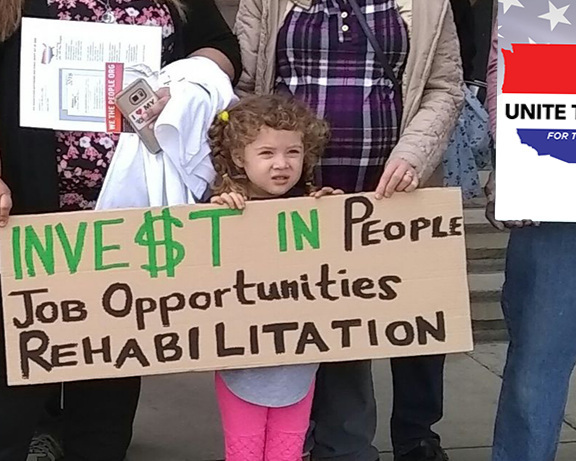 Unite the People joined Restore: Justice for this campaign and generated hundreds of phone calls and thousands of emails and petitions signatures to the California Legislature and Governor Brown in support of SB1437. Assembly Bill 2138 gives Californians with criminal records the ability to attain occupational licenses for occupations from which they were previously barred. Covered occupations range from automotive repair to psychology to cosmetology. Previously, former inmates were denied licenses—even for jobs they are qualified to perform—due to old or irrelevant criminal records. In some cases, people were denied licenses for jobs they have performed successfully for years in the past without incident—or were trained to do while incarcerated—simply because of a conviction for a minor offense. Unite the People gathered signatures and phone banked with a diverse coalition of organizations including East Bay Community Law Center (EBCLC), Root & Rebound, All of Us or None, Anti-Recidivism Coalition, the National Association of Social Workers, and many more to pass the bill.